Bill Monroe’s Bean Blossom Bluegrass Festival, the world’s oldest, continuous running bluegrass festival, will return to Brown County for a 49th year, June 13-20. Not only will the 49th Annual Bill Monroe’s Bean Blossom Bluegrass Festival feature performances by the biggest names in bluegrass, this family-friendly event also will include daily music and instrument workshops. A complete music line-up is available online at www.billmonroemusicpark.com. Also returning to the festival for a 10th year is the Bean Blossom Bluegrass Youth Boot Camp. Led by Sarah Wasson and sponsored by the Central Indiana Bluegrass Association, the camp includes 15 hours of instruction, followed by a live performance on the Bean Blossom main stage by participating students. The festival also includes admittance to the Bill Monroe Bluegrass Hall of Fame Museum and a tour of historic Uncle Pen’s Cabin. Well-known SiriusXM Bluegrass Junction radio host Kyle Cantrell, alongside the legendary Tommy Lamb and infamous Sam Jackson, will emcee the event. Sound will be provided by Tom Feller and J&R Productions. Tickets for the festival range from $25 to $35 for daily tickets, $90 for three-day weekend passes and $200 for all eight days. Individuals 13-16 years old receive $5 off per day and children 12 and under are free. Fall in love with beautiful Bean Blossom just like Bill Monroe. 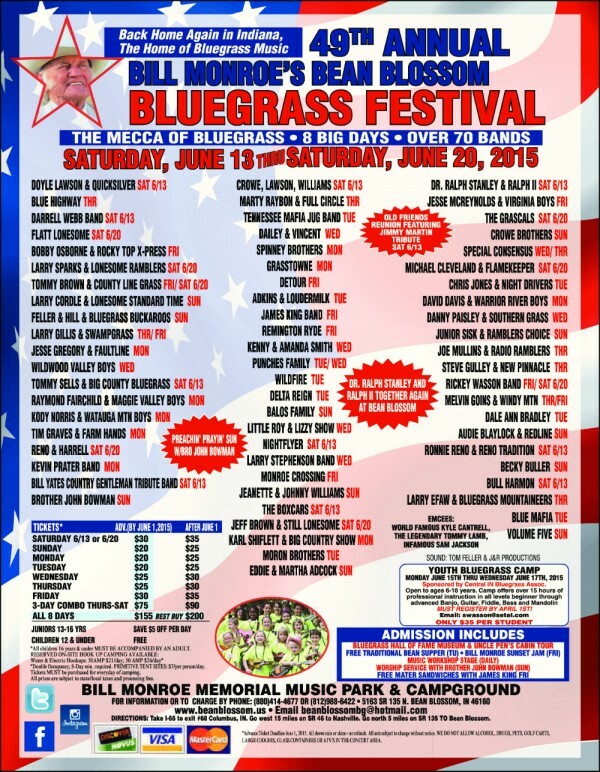 Experience the Mecca of Bluegrass and become part of the tradition at the 49th Annual Bill Monroe’s Bean Blossom Bluegrass Festival, June 13 through 20. For more information on the festival, please visit www.billmonroemusicpark.com or call (812) 988-6422.